The following is a guest post by Betty Jean Craige, author of Fairfield’s Auction. 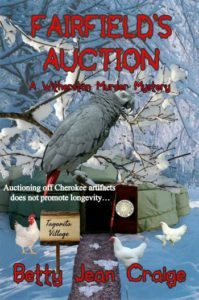 Fairfield’s Auction is the second in the Witherston Murder Mysteries (published by Black Opal Books) set in the fictive town of Witherston in the southern Appalachian mountains of north Georgia. The first was Downstream, which came out in 2014, and the third is Dam Witherston, which will come out in 2017. Witherston is situated twenty miles north of Dahlonega, center of the 1828-29 Georgia Gold Rush in the heart of Cherokee country, that is, the region the Cherokees occupied for a thousand years, before the white settlers sent them on the “trail of tears” to present-day Oklahoma. The characters in my Witherston novels include Detective Mev Arroyo, her husband Paco and twin boys Jaime and Jorge, their eccentric aunt Lottie Byrd, and their various friends, human and otherwise. 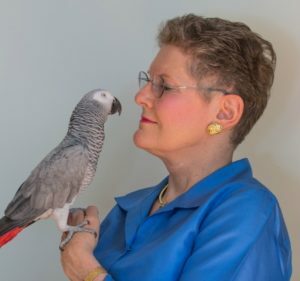 In Fairfield’s Auction, Doolittle, the African Grey parrot, helps solve the mystery. The chickens don’t do anything more than the average chicken would do. I included a chicken liberation scene because every time I’ve follow a chicken truck, with feathers flying, down the highway I’ve fantasized about liberating them from their tiny cages. So how did I start writing mysteries in my retirement years? I grew up in El Paso, graduated from Pomona College in southern California with a major in Spanish literature, got my PhD in Comparative Literature at the University of Washington, and in 1973 took my first and only academic job at the University of Georgia. I retired in 2011, wrote a funny column about animal behavior in our local newspaper for two years called “Cosmo Talks,” and then, at the urging of novelist Terry Kay, turned my hand to fiction. I had enjoyed mysteries since childhood, when I discovered Nancy Drew, so I began writing mysteries, “cozy” murder mysteries. We’ve all heard the advice “Write what you know about.” Well, I write what I want to learn about: chickens, Cherokees, the north Georgia mountains, money laundering, genetic ancestry, crime…. I could go on and on. Fiction writing is exploration—of whatever. I hope I can continue writing fiction till I bite the dust, take my dirt nap, push up daisies, buy the farm, don a pine overcoat, feed the worms, sleep with the fishes. Amen. Read Betty Jean Craige’s other guest post on Book Obsessed: From Non-Fiction to Fiction. More about the author and her work: Betty Jean Craige’s website.